In this post I will be taking a look at the diversity of the junior partner to Trebouxia: Asterochloris. 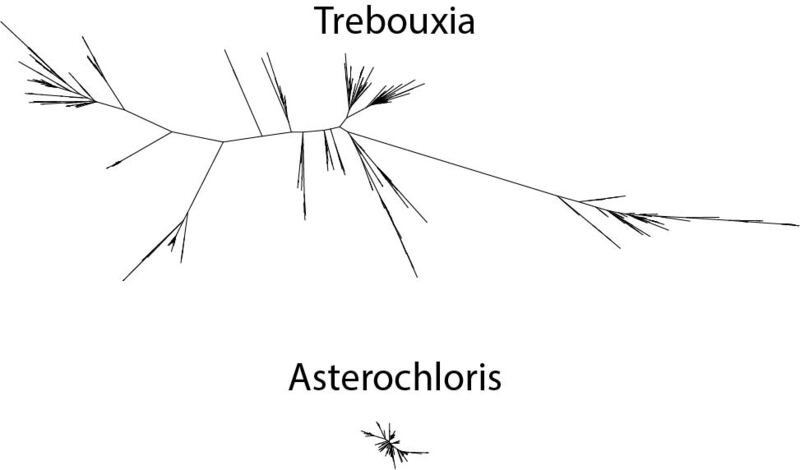 Originally described by Elisabeth Tschermak-Woess in 1980, Asterochloris was subsequently merged with Trebouxia before being split out again on the basis of sequence data in the late 1990s. For the most part, Asterochloris is thought to be restricted to associations with lichens in two closely related families, Cladoniaceae and Stereocaulaceae. However, this includes Cladonia, one of the more charismatic (and ecologically important) lichen groups, so Asterochloris has been extensively sampled. 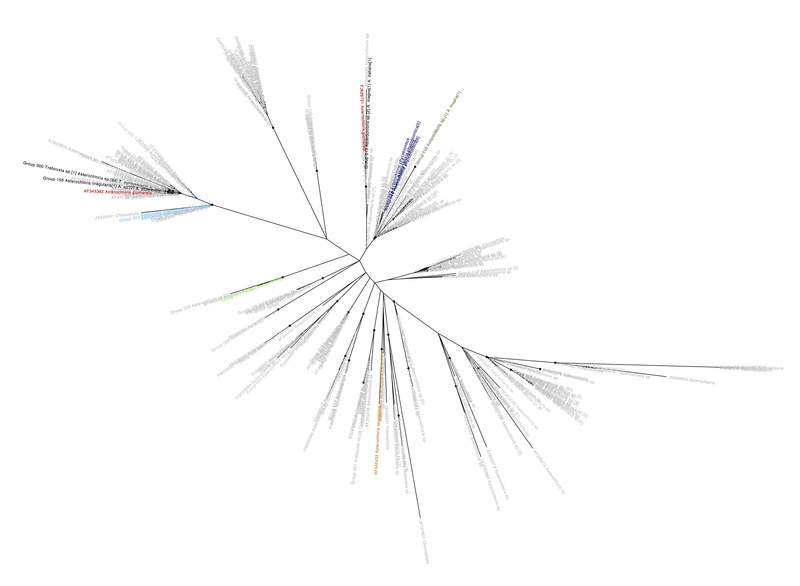 This works on unaligned sequences and produces a file of non-redundant sequences in addition to the list of groups, which can be used directly for alignment and phylogenetic inference. The detailed steps of this analysis are here. Datasets can be found here. This has more to do with the huge amount of sequence divergence within Trebouxia than it does any lack of diversity in Asterochloris. Most of Asterochloris clusters above have at least 2% sequence divergence from one another, so it’s not unreasonable to consider them different species. The named representatives of three species (A. phycobiontica (dark blue), A. erici (light green) and A. excentrica (light blue) ) form coherent clusters in the tree. 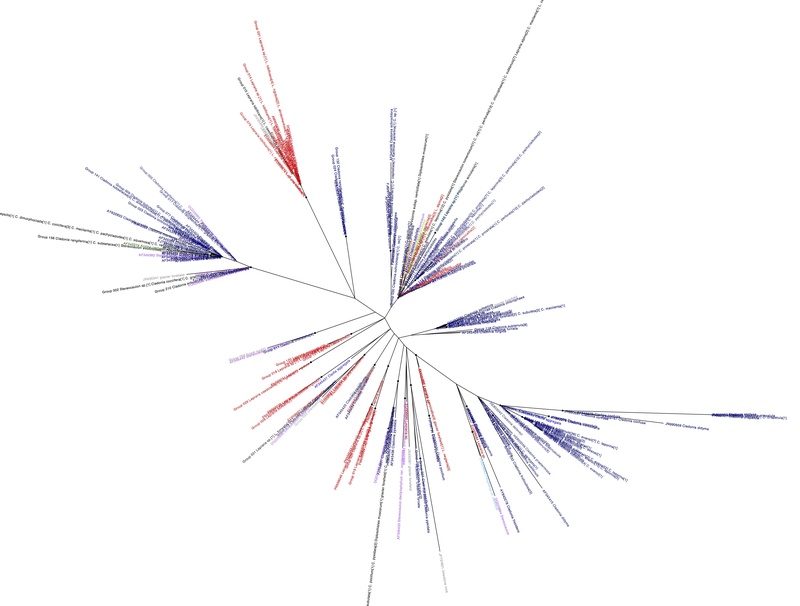 Strains identified as A. glomerata (red), A. magna (dark green) and A. irregularis (orange) each fall into two clusters, though it is difficult to see for the latter two species because some of the sequences are identical to those from representatives of other species and are thus labeled black. Two additional species, A. italiana and A. pyriformis are only represented by sequences that are identical to sequences from other species. There are also photobionts of Cladia, Pilophorus, Pycnothelia, Anzina, Diploschistes, Ochrolechia, Varicellaria and Xanthoria. The first three of these are closely related to Cladonia, while the others are a diverse assemblage of lichens. With the exception of Xanthoria, none of these genera have been found to associate with Trebouxia. Xanthoria is listed as the host for A. italiana in GenBank, but the authors make no mention of this in their paper and the host is not listed in the culture collection info, so it should probably be taken with a grain of salt. Interestingly, there are also a number of Asterochloris sequences that were obtained from environmental sampling (one from limestone rock and two from forest soil and ten from a glacier forefield). It is certainly possible that these were derived from lichen fragments or vegetative propagules, but there was only a single Trebouxia sequence that was not from a lichen thallus despite almost three times as much sampling, so these results suggest that Asterochloris may be a facultative lichen photobiont while Trebouxia is obligately lichenized. Other than the A. phycobiontica cluster which is associated with a diverse array of lichen genera, Lepraria tends to be associated with distinct lineages compared to Cladonia and Stereocaulon, while the latter genera overlap in their photobiont preferences. There is also a lot of interesting host association patterns at the species level for this group, a topic that I hope to explore in the future. This entry was posted in Green Algal Photobionts and tagged Asterochloris, Cladonia, Cladoniaceae, Lepraria, Lichen, Stereocaulaceae, Xanthoria. Bookmark the permalink. 2 Responses to Green Algal Photobionts: Asterochloris. Taken as a whole, and no doubt allowing for plenty of exceptions, the ecological province of Asterochloris seems to be rock and soil. No? Great site, Heath! Sorry to be so long getting around to looking at it. I’ll be back! !